Fold Up Tote - 18-3/4" x 15"
Take this logo tote bag to-go! Storing this lightweight 90g polypropylene shopping bag couldn’t be easier since it packs right up into its own tiny pouch. Stash in a foyer, glove compartment, purse, bike basket or desk drawer for running errands. Tote bag is designed with two 23" self-material handles for comfortable over-the-shoulder carry. 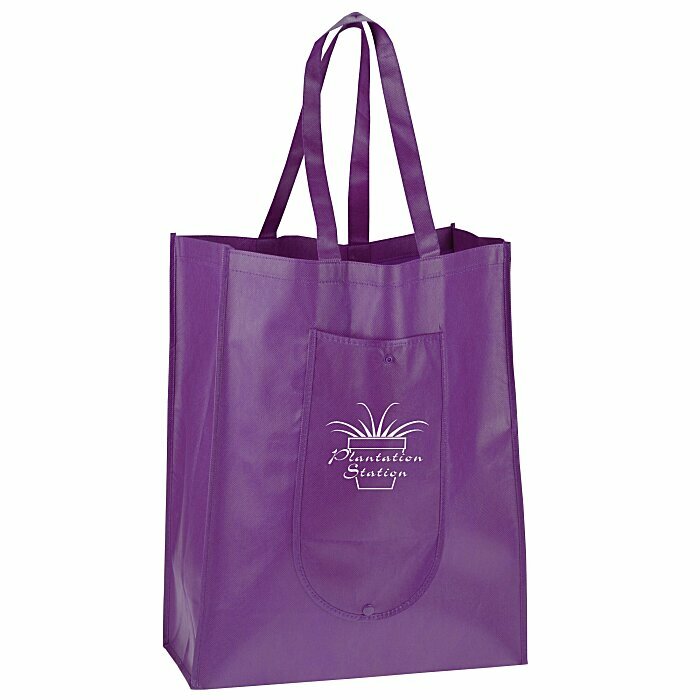 Reusable non-woven polypropylene tote is more durable and less wasteful than in-store bags. For the smaller version of this customized tote, see item #105743-1416Fold Up Tote - 14" x 16". Size: 18-3/4" x 15" x 7-1/2". Your price includes a one-color imprint on the front of the shopping tote. Set-up charge: add $55 per color/location. Imported, logo applied in Canada.